The latest bout of selling in equity markets has been compared to the big drop below the 200-day moving average that occurred in October 2014. While the 2014 breakdown was similar to what’s happened this year in terms of its rapid descent, looking at the big picture, the current decline appears to me to be more like what happened in 2011 than what happened in 2014. The chart below of the S&P 500 index over the past five years tells the story nicely. 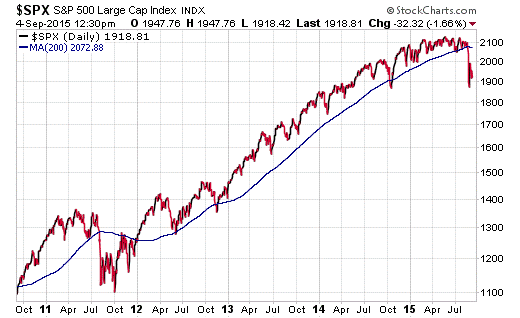 Here we see that in 2014, we had what’s called a “V-shaped” bottom in stocks. There was a sharp breakdown below the 200-day moving average (blue line) and then a subsequent swift move back above the 200-day moving average (MA) that kept stocks grinding higher until this July. In 2011, we had a swift breakdown below the 200-day MA in August, but the difference between 2011 and 2014 is that the market stayed well below the 200-day MA for most of the rest of the year. In fact, it took Federal Reserve “QE” to kick buyers back into the market and to send stocks back above their long-term trend line. I suspect that we are in the same situation now as we were back in 2011. This is not going to be a 2014 “V-shaped” bottom. Rather, I think we are in for a tough slog through the remainder of the year. The big difference between this year and 2011 is that the Fed is on the verge of hiking interest rates this year, not easing up the way they did four years ago. We won’t know what actually happens with the Fed until the September 17 decision is announced, but what I think we can say with supreme confidence is that this market is in for more volatility until then. If you are a serious ETF investor that wants to get positioned for the current volatility, you need my Successful ETF Investing advisory service. My subscribers have remained calm, and in the safety of cash, throughout the past several volatile weeks of selling. If you’d like to find out how you can get that sense of calm too, click here. It’s Labor Day weekend, and if you are planning a road trip with friends and family, you’re not alone. Some estimates I’ve read say there is going to be record road travel this weekend, which is largely a consequence of the lowest gas prices at this time of year in more than a decade. And while taking that road trip can be fun, it’s important to remember to be safe, stay calm — and to not let the stress of the road get the best of you. In case you missed it, I encourage you to read my e-letter column from last week on Eagle Daily Investor about why bad things happen under the 200-day moving average. I also invite you to comment in the space provided below my commentary. “A Chinese stock market crash could set off a chain reaction around the world.” (August issue, Forecasts & Strategies, p. 4). Recently, I watched the film “Fast and Furious.” I thought it was a perfect description of the first serious sell-off since the financial crisis of 2008. I felt it coming, and I have warned my subscribers in my various hotlines, teleconferences and August newsletter that a major correction was on the horizon and China would be the key factor.